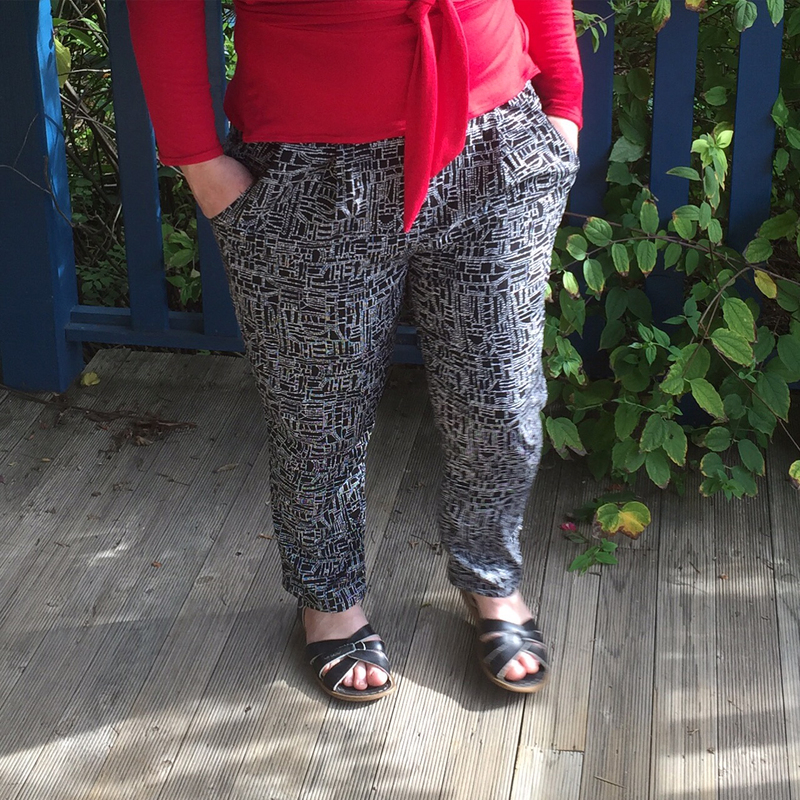 I've looked at the Alexandria Peg Trousers pattern several times in the past and each time I have dismissed them as something that was never going to look good on me, but after a disastrous day trying to make Burda 6770 I took another look at them. I don't even have a picture of the Burda pants to show you, I got rid of them after trying to make them wearable - they were huge and taking them in wasn't working, it really wasn't worth altering the pattern when there are so many loose fitting pants patterns around. So I figured the Alexandria Peg trousers couldn't be any worse on me. I bought, printed, cut and sewed them in a few hours and they are pretty near perfect. I was between 2 sizes so I cut the smaller one. The only alteration was shortening the pattern about 2.5" before I cut them out. I used some rayon I bought at Spotlight. I am quite impressed with the selection of rayon there at the moment, I must get some more. I love the pockets and pleats and everything fit together perfectly. I am wearing them now and they are so comfortable, they are going to be great in summer with t-shirts and they are perfect now with low cut boots and longer tops and cardis. If you are looking for elastic waist pants I highly recommend this pattern. They really look fab on you and it's a stylish look and great fit. Trousers are such a tricky thing. I'm still hunting, but have just downloaded the pattern - full of optimism. Fingers crossed they look as good on me as they do you. You totally rock them Kate! Perfection. I love the pattern and the fabric! I have been searching for a pattern for slouchy trousers like these that relaxed but not so relaxed that they are work inappropriate> I hope these look as good on me as they do on you! This pattern is just what I have been looking for, thank you Kate, they look lovely. I made them for Zara and they were perfect, thank you so much. Love these!!! I am yet to make trousers for myself, they scare me!!! I also have this fabric, love it I bought 5 metres, secretly I think I could have done with double that, I have so many ideas for it.